Moisture From Hurricane Kenneth For Thanksgiving! 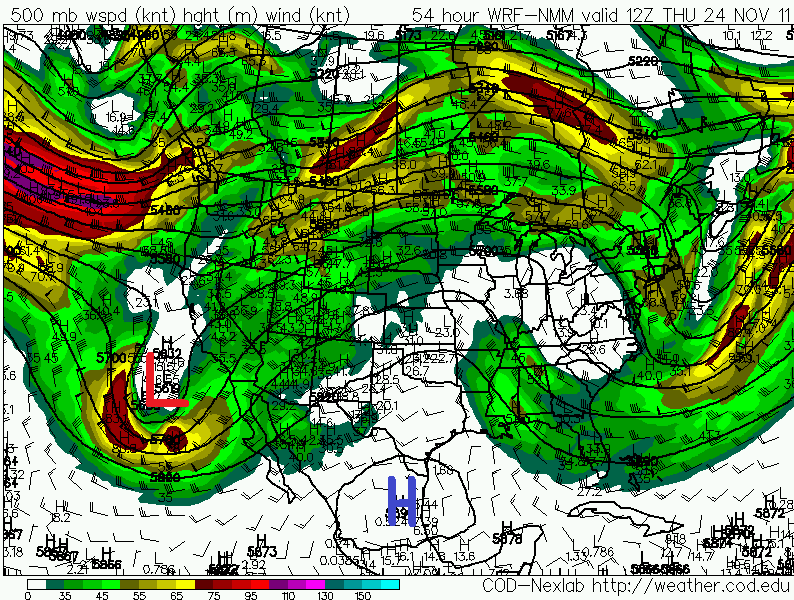 Last Nights 06Z/11 PM MST WRF-NMM 500 MB Forecast. 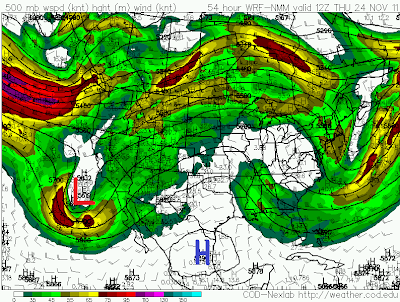 Valid At 12Z/5 AM MST Thanksgiving Morning. For the past week I have been saying that our Thanksgiving weather this year was going to be uneventful. So much for southeastern New Mexico's tranquil weather forecast for Thanksgiving. Mother nature is getting ready to throw us a curve ball. A strong Pacific trough of low pressure, located in the mid and upper levels of the atmosphere, will dive southward, and into southern California by Thanksgiving morning. The latest forecast model trends continue to deepen and slow down this storm, and close it off over the Baja Region on Thanksgiving. If these trends continue then this storm may not move east of us until Friday night. At 6:30 AM MST This Morning. 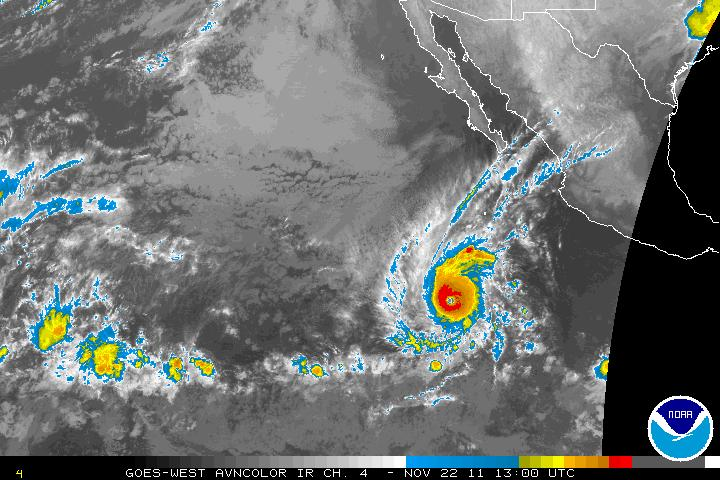 IR Satellite View Of Hurricane Kenneth At 6 AM MST. NHC Forecast Track Of Hurricane Kenneth. 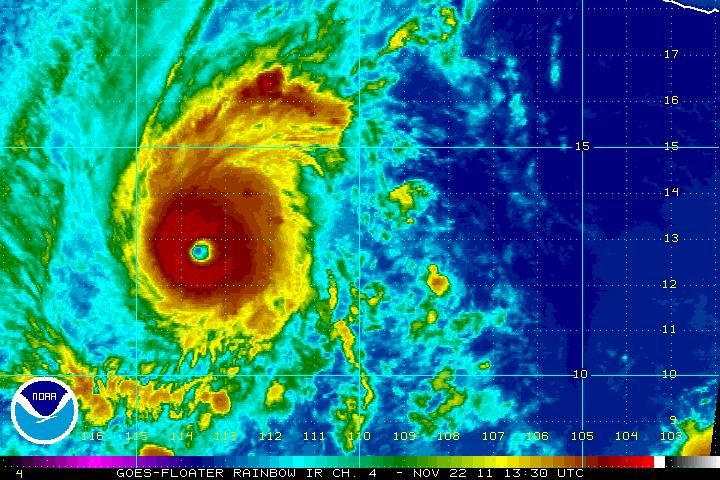 As of midnight MST, Hurricane Kenneth had reached Category 3 (Major Hurricane) status. He had sustained winds of 125 mph with gusts near 155 mph. His central pressure was down to 957 millibars, or 28.26 inches of mercury. Kenneth was moving due west at 12 mph. Kenneth continues to rapidly strengthen this morning, and could possibly strengthen to a Category 4 Hurricane, or maybe even a Category 5 Hurricane today. 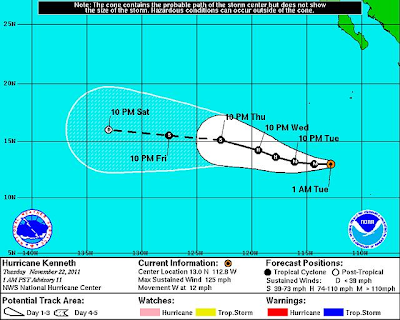 Kenneth will weaken fairly rapidly as he moves westward into cooler waters after today. 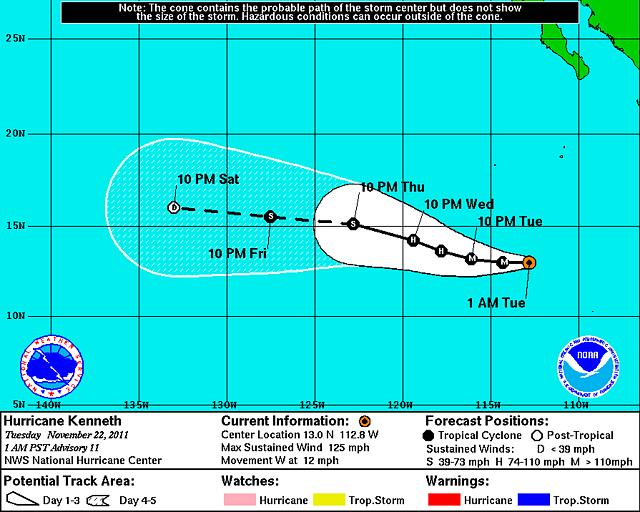 Much to everyone's surprise, Hurricane Kenneth formed nearly a week ago. The last time a Hurricane formed in this area of the eastern Pacific Ocean this late in the season, was 28 years ago when Hurricane Winnie developed in 1983. Two Storms Interact To Make Our Thanksgiving Weather Interesting. 06Z/11 PM MST GFS Precipitable Water Forecast. 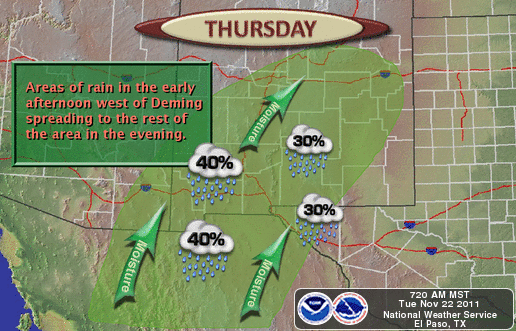 Fairly tranquil weather is anticipated today across SE NM today and tomorrow. It will be a little cooler with lots of sunshine. Our afternoon high temps forecast to be in the upper 60's, with perhaps a few spots reaching 70. Sometimes you have to have a sense of humor to appreciate the odd nature of our weather. Yesterday's severe thunderstorm and its associated haboob, that produced the 62 mph wind gust at the airport, and the near zero visibilities in town along with the blowing dust at 3:10 PM, was odd to say the least. This is not typical for the end of November in any way. Even more strange weather appears to be headed our way for Thanksgiving into Friday. As the strong mid-upper level storm approaches the state on Thanksgiving, it is going to pull some of the remnant moisture for Hurricane Kenneth northeastward, and into New Mexico. This is a fairly common even in the late summer and fall, but is just crazy for this time of the year. Clouds and rain showers will increase across southern New Mexico on Thanksgiving Day, and will spread eastward and northward with time. It still appears that Thanksgiving Day will be mild, with our afternoon high temps still expected to be in the mid 70's. Our best chances for rain here in southeastern New Mexico will likely occur Thursday night into Friday. Don't be surprised if a few thunderstorms are not mixed in as well. Should the storm to our west slow down even further than what the models are currently forecasting, then our best chances for rain showers and thunderstorms would be on Friday into Friday night. Since a sub-tropical airmass will overspread the area, snow levels are forecast to be very high, and will generally be found at around 10,000' Thanksgiving into Friday morning. As a strong Pacific cold front blows through the area Friday afternoon, snow levels will drop down to around 7,000' MSL. There could be a brief period of heavy snow in the mountains Friday afternoon. 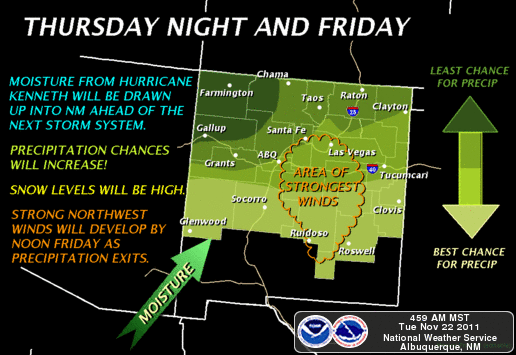 Strong gusty winds will also accompany the frontal passage on Friday. I will keep this blog updated with the latest developments on this Thanksgiving storm, so please be sure to check back here for the latest. Thanks for stopping by. 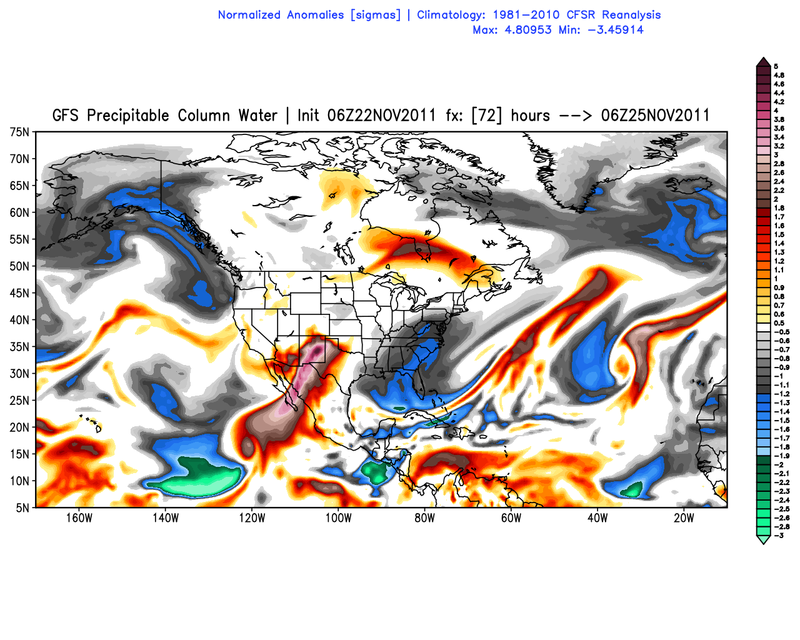 Wouldn't that be interesting to get tropical moisture in late November. We could use the rain in Abq, though the earlier forecast of 60's would be nice, too.